Southeast False Creek Vancouver’s most affordable homes are coming soon! 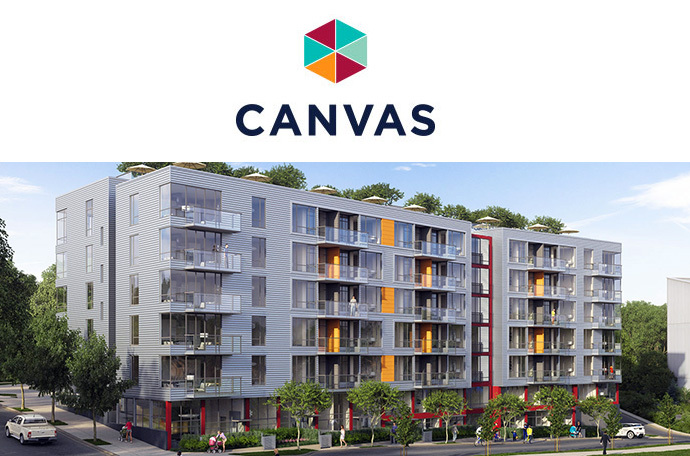 CANVAS by Onni is the next bright idea coming to the Vancouver False Creek Flats neighbourhood in the award winning and world class Southeast False Creek community. Located at the crossroads of this beautiful city, CANVAS Vancouver False Creek apartments are walking distance to the seawall, local transit routes including the Canada Line SkyTrain and buses, as well as fine dining and casual eateries and coffee shops. As well, the neighbouring Great Northern Way Campus and future home of Emily Carr University of Art + Design will be within easy walking distance from your front door at the False Creek Vancouver CANVAS apartments coming this Spring 2014! The stunning modern architecture is by award winning gBL Architects (with signature corrugated metal, splashes of colour and private roof top patios) and the community focused development brings a warm and approachable feel to this area. Located right on the new Central Valley Greenway, the new Southeast False Creek CANVAS Vancouver condos will connect you between work and play, downtown and the rest of Vancouver and your family and friends. Giving you maximum freedom, amazing features and finishes and a plethora of floor plans ranging from studios to two bedroom layouts, the new CANVAS False Creek apartments are the most exciting project for early 2014. Inside, homebuyers can expect to find functional and high-end linear kitchens, beautiful flooring and sumptuous ensuite bathrooms. The development itself will consist of 2 residential buildings that are connected by an open air centrally courtyard and future green space. In addition, the False Creek Vancouver CANVAS Condos are situated within close walking distance to the waterfront, SkyTrain Line and bus routes. CANVAS – Live on the bright side. Visit www.onni.com/canvas/ for more information or you can also register on this blog page for more information as they become available from Onni. In addition, the new False Creek Flats Vancouver condos will feature a 4,000 square foot on-site amenity space that will include a professionally equipped gym, flexible art gallery space and large collective work space. In addition the CANVAS Vancouver condos will have a communal outdoor courtyard oasis with lush green landscaping, fire pit and garden plots (professionally designed) and an outdoor children’s play area. The safety features are incorporated through a comprehensive CPTED Analysis and includes key fob access control, secured underground parking with closed circuit camera and ample lighting in addition to pre wired security alarm systems in each suite and solid core suite entry doors. PLEASE NOTE that these are draft finishes and are subject to change at any time. We advise that you speak with a sales representative and/or your agent in order to find out more. The interior finishes at the affordable Vancouver CANVAS False Creek apartments are excellent and will have a modern take that strikes the balance between functionality and timeless aesthetics. Classic will meet contemporary, clean lines will meet modern materials and spacious living will meet functional space. > European made commercial-grade, wide-plank laminate flooring throughout entry, living, flex space, and kitchen. Here is some of the presales information that we’ve gathered from online resources such as BuzzBuzzHome and VanCityBuzz in regards to the new CANVAS by Onni apartment development coming this Spring 2014. The location of the new Southeast False Creek apartments for sale is at the corner of Great Northern Way and Thorton Avenue Vancouver. This central location will be just steps away from the Canada SkyTrain Line, numerous amenities and services around the community, the Olympic Village district, Seawall, water, and recreational facilities. In addition, the Great Northern Way Campus as well as the future Emily Carr University of Art + Design will be located within the Southeast False Creek Vancouver CANVAS apartment development site. Marketed as the area’s most affordable apartments for sale, the new CANVAS Vancouver condos are expected to cost between to lower $300’s to over the mid $400’s, but this is subject to change at any time. It’s also expected that the floor plans offered will be between junior one bedroom suites to 2 bedroom plus den spacious homes. • 1 bed – 2 bed + flex homes from 470 – 960 sq.ft. • 136 HOMES UNDER $350,000 including parking & storage! Diverse cultures come together to live work and play in this world-class community. Run on the seawall, catch the SkyTrain downtown, explore the local art galleries or cycle the greenway: From the False Creek Flats Vancouver you can do it all. At the corner of Great Northern Way and Thorton Avenue Vancouver CANVAS condos neighbour the future Emily Carr University of Art + Design and the Centre for Digital Media. Connected to the city by the Central Valley Greenway and the SkyTrain, this is the city’s new bright side. Community > The False Creek Flats Vancouver neighbourhood is an extension of the world class Southeast False Creek community and is fast emerging as the city’s most vibrant art districts. At the crossroads of the city, Canvas Vancouver condos is walking distance to the seawall, transit and restaurants while neighbouring the Great Northern Way Campus and Centre for Digital Media and future home of the Emily Carr University. Artistic, modern and contemporary, the False Creek Flats Vancouver Canvas condos will have edgy design that takes cues from its artistic neighbours with corrugated metal siding and bright splashes of colour. Inside meets outside with a lush, green landscaped courtyard and private rooftop patios for some homes! Artful Architecture > Designed by gBL Architects, this modern building is a contemporary take on the community focused building. Warm, approachable and located directly on the Central Valley Greenway, CANVAS Vancouver apartments will reflect the vibrancy of the nieghourhood and provide spaces for neighbours to meet and mingle. The False Creek flats CANVAS homes are designed to give you maximum freedom to express yourself: open concept studios, one and two bedrooms with linear kitchens, in two buildings connected by a green, open air courtyard. Building Features include modern design by gBL Architects featuring corrugated metal, splashes of colour and private roof top patios as well as a central location situated on the Great Northern Way Campus, home to the Centre for Digital media and future Emily Carr University of Art + Design. The Southeast False Creek Flats Vancouver CANVAS apartments are also walking distance to the waterfront and transit stations and will feature a lush central courtyard divides the site which is located across from a future communal green space. A new article on www.vancouverisawesome.com features this newest addition to the False Creek Flats neighbourhood. Here are some highlights from the article (visit http://vancouverisawesome.com/2014/02/24/the-new-southeast-false-creek-flats-live-in-vancouvers-coolest-new-neighbourhood/ for the entire article). You know the industrial zone along Great Northern Way, just east of Main? Long ignored by Vancouverites, this neighborhood, the Southeast False Creek Flats is about to launch a major transformation. The area’s storied industrial history includes an unprecedented donation of 18-acres from Finning, an international machinery company, to the GNW Trust, a collective of universities including Emily Carr, SFU, BCIT and UBC. This paved the way for some major changes. Currently home to the Centre for Digital Media, the site will also soon be home to the new Emily Carr campus and to a two-building condo development called Canvas Vancouver condos. The Onni Group is the only developer to be building on the GNW site and sales of mostly one-bedroom homes are set to begin this spring. Clad in corrugated metal and studded with splashes of colour, Canvas will feature 209, artist-inspired homes. For more details, check out www.onni.com/canvas/. Most Affordable Homes In Vancouver’s Southeast False Creek Community! According to their website: Diverse cultures come together to live work and play in this world-class community. Run on the seawall, catch the SkyTrain downtown, explore the local art galleries or cycle the greenway: From the False Creek Flats you can do it all. At the corner of Great Northern Way and Thorton Avenue, CANVAS Vancouver condos neighbours the future Emily Carr University of Art + Design and the Centre for Digital Media. Connected to the city by the Central Valley Greenway and the SkyTrain, this is the city’s new bright side.